CEO and buyer of Ms. Brafit Limited, Nicole Joseph-Chin, was not always involved in the intimate apparel business. After a 15-plus year career in the financial sector, she decided to address her difficulty finding properly fitting foundations. 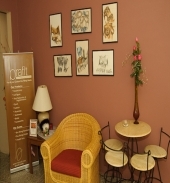 In 2002, she opened the Ms. Brafit Limited store in Trinidad at 900-square-feet. She described it as "the first and only intimate apparel shop in the Carribbean with custom-fitting services and post-mastectomy products." Now, her business employs three people, and she has added a distribution office in Saint Lucia and a purchasing website to her roster. True to the company name, she emphasized, "bra fitting is the most important aspect of a visit to Ms. Brafit." She is a BOC certified bra and mastectomy fitter, as well as a certified radiant impression fitter. With bras ranging from 28A to 60L at prices of $25 to $200, Ms. Brafit Limited carries sizes and prices for most women. Since post-mastectomy products are a big part of their business, Joseph-Chin commented: "We take our social responsibility very seriously." Her staff volunteers with all of the cancer support groups in Trinidad Tobago and Saint Lucia. They also host their own bra fitting parties, and seminars on everything from health education to wine tasting. Since they cater to several client bases, including post-mastectomy, post-surgical, maternity, full-figured and the general market, Joseph-Chin said clients range from "the newly developed teen to the retiree." Seniors are encouraged by the fact that the retailer has an alliance with the Trinidad and Tobago Association of Retired Persons (TTARP), through which they offer discounts. The average customer has a DD cup or larger, and spends $100 to $500 per visit. Highest-selling brands are Fantasie, Le Mystere, the Little Bra company, and Goddess. Currently, strapless bras ranging from $60 to $100 are very popular, with the most-requested bras as the Goddess All Over Lace Soft Cup, and the Fantasie Full Cup Underwire Bra. Joseph-Chin commented that customers "keep coming back" to her store because the staff treats them "like family." Focuses are respecting customers' privacy, promoting breast health, suggesting pieces that fit with their lifestyle and pampering them. Staff and the last client of the day indulge in some wine (or tea) and cheese, which is "a great way to unwind after a long and busy day." "The store’s concept is customized fitting in a boutique/spa like environment with pampering and luxury for every woman we serve,” Joseph-Chin said. "We have gift certificates and many times men call for orders, or they accompany their significant others to the store. We serve pastry, espresso and other luxury items, which the men can indulge in while they wait." To keep business up during the recession, they are partnering with other companies that compliment their services. They are also part of a referral network that is expanding outside of Trinidad. "These networks will prove to benefit all involved," Joseph-Chin said. "We will all win in these very tough times but only together and with each other's support." Additionally, they advertise in newspapers and magazines including the Trinidad Guardian and the Trinidad Express. They have also been featured on several local news stations in Trinidad and Saint Lucia. On February 1st, they re-launched an upgraded website, and they have a fan page on facebook.com. Although there are many stores that sell bras in the area, Joseph-Chin does not see the competition as a problem. "Ms. Brafit makes for a different kind of shopping experience," she said.